Click on the image to go to the Audible webpage. 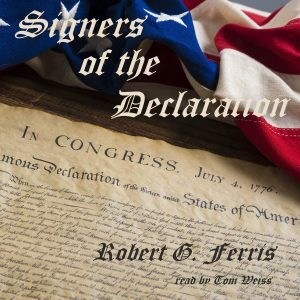 For historical buffs, Signers of the Declaration is a nonfiction work that offers short biographical sketches of the 56 signers of the Declaration of Independence. Outside of their colony, many of the signers were not well known. In general, the signers were individuals who happened to be delegates sent from their colony to meet in Philadelphia and organize colonial resistance to Parliament’s coercive tax acts. Of the 56, only eight were born in Britain. Unknown to most Americans, the signers did not all sign the Declaration on July 4, 1776 as is commonly believed. In fact, it took over a year for all the delegates to sign the Declaration and the Revolutionary War had been raging during that time.